March 13, 2019 9 am. It is a cold and clear day with a promise of warmth later on. I am headed out to the north end of our valley to count the Tule elk and check on how it is going with their antler shed. 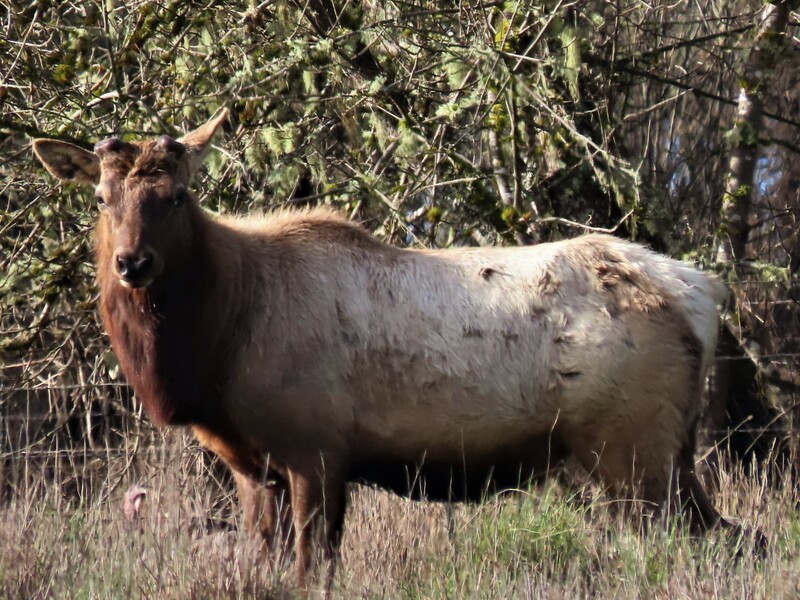 This time of the year the bull Tule elk begin to act a little crazed. All the bulls, some with their huge (can be over 40-pounds) antlers and the other younger bulls with their spikes, begin to rub them on every tree or structure that feels right. This may be just the right roughness or angle or just something in their way! There are favorite places, trees that seem to be used over and over, such that the tree (a willow or ash) begins to look like it may not survive the thrashing. I observed a large bull battering a fence post and then one of our plastic tube crossings, trying to get that darn antler to come off. There have been bulls running around with an antler dangling off of its head, shaking it madly to rid itself of that appendage. This is the first time I have seen this yearly phenomenon up close. It is astounding to see the impressive holes left in the bulls heads when they finally do get the antlers to fall off and the ensuing blood that occurs right after. It seems to take a few hours for the healing over of the area. What does it feel like to suddenly have no heavy weight on their heads? Our project manager said he thought it would feel like a giant scab that needs to come off, extremely itchy! Now the process of growing new antlers will start over again and by May all the bulls will have grown their antlers back. 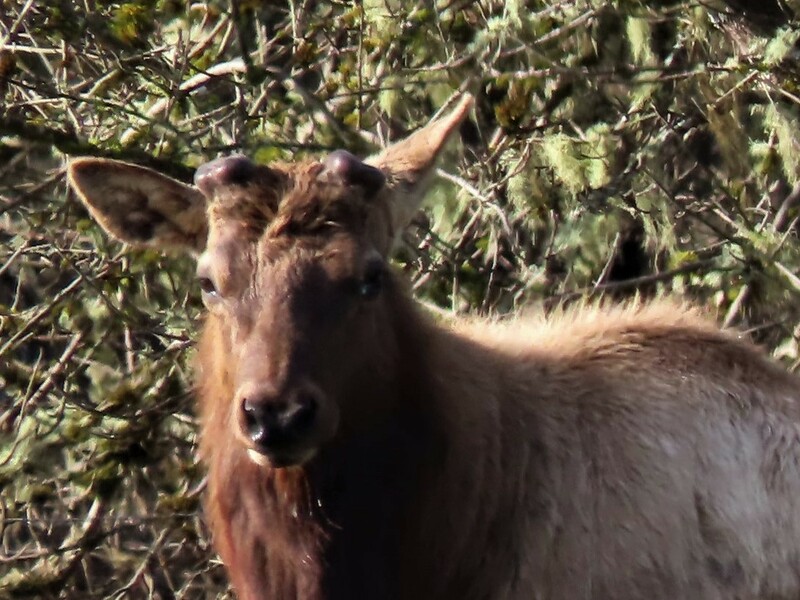 After dropping their antlers, bull elk begin to get a new set covered in “velvet”. Velvet is a term used for the appearance of the antlers, looking as if they are covered in a velvety texture. Surprisingly the velvet on antlers is a system of blood vessels that nourish the bone as it grows. The antlers are sensitive in this stage and not used to defend themselves or rub on anything. A” spike bull” is less than two years old and has only one point on his antlers. Every adult bull loses its antlers each year, so a spike bull only remains this for a year or two then begins to get more points. They do not grow a point for each year. What an impressive cycle to go through, especially if you think about the 40 pounds of bone growing out of their heads each year only to be shed in the spring. Antlers are used as weapons by the males to compete for a chance to breed. The large rack of the mature bull is intimidating to a young bull but even smaller sized racks are often reason to engage in combat. Vocalizations and posturing can be used instead of a fight though if not successful, the crashing of antlers will occur. I have seen younger, or lesser, bulls sparring in a friendly or fun way, possibly for the experience, but keeping a barbwire fence between them thus allowing the combat from becoming too intense. 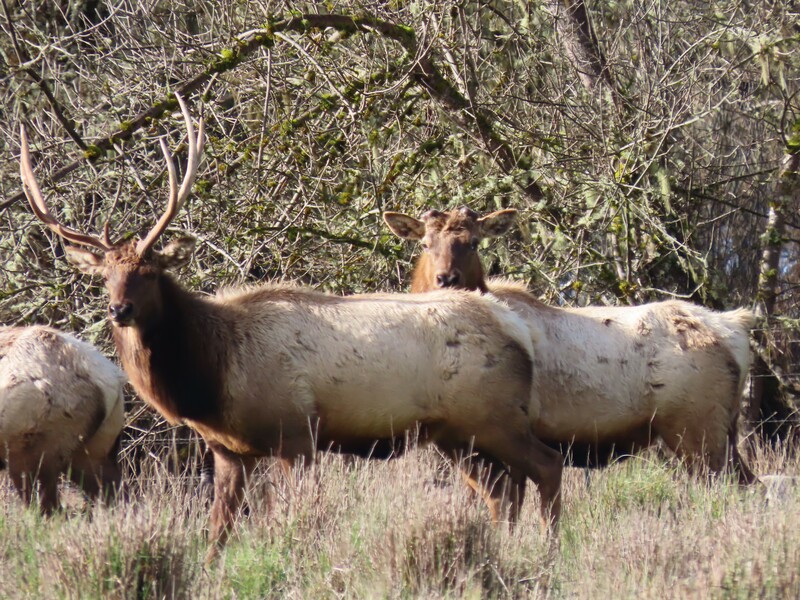 Today I count 43 Tule elk (yesterday there were 47) and am able to take photos of the bulls in different stages, a young calf bull with its first “velvet”, a couple of larger bulls with their antlers just fallen off, and a bull with its antlers still intact. The adults look a little ragged with their winter coats beginning to wear out. Soon all the adult bulls will have lost their antlers and have begun to grow their velvet new ones with new shiny coats to dress up in. This will be the next dynamic part of this elk herds life when the vying for dominant bull begins. That is when the bugling begins and the sparring is everywhere. This living cycle is just one of the many natural dramas that occur each year in the extraordinary world we live in. 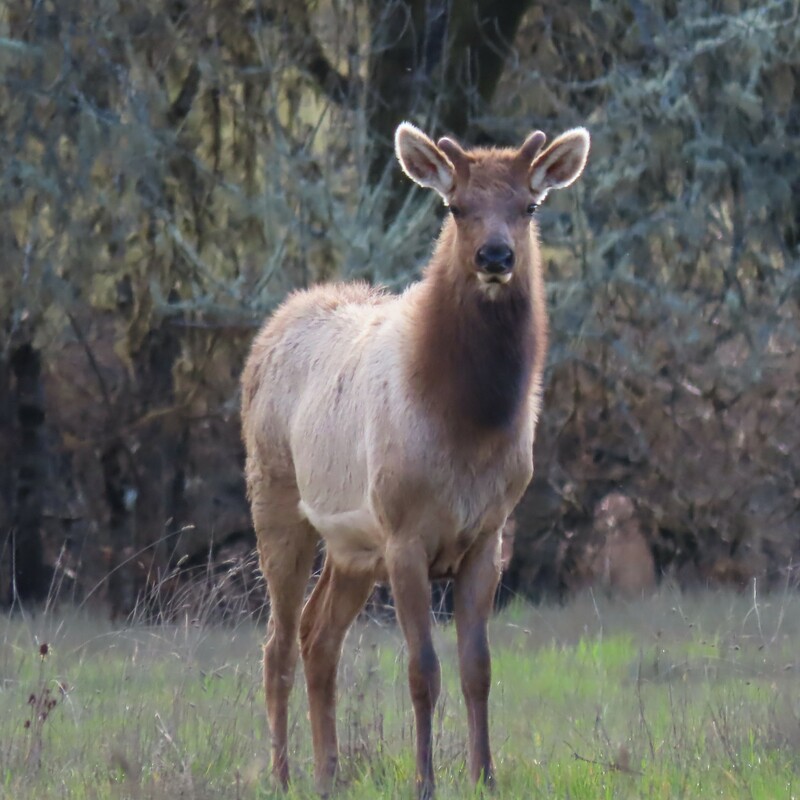 The beginning of spring brings much change in the world of the Tule elk and in all of nature.